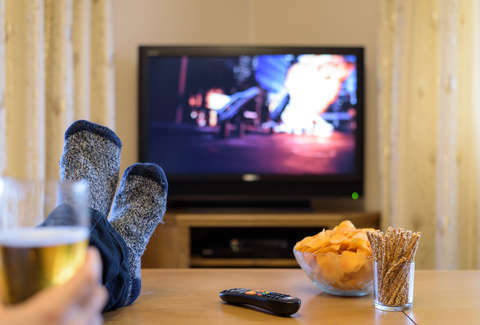 Decamping to the couch on Sunday for a furious binge-watching session is hardly what most people would consider "productive," and it's easy to feel guilty wasting an entire afternoon in front of the TV. But who cares what other people think, you have every right to be as lazy as you damn well please, and frankly, there's so much top-notch TV out there these days that you'd be a fool not to mainline it every once and a while. In fact, now there's an even better reason to embrace your TV obsession, because a new job just opened up that'll pay you a cool $2,000 just for streaming your favorite shows and sports games. The team at streaming service comparison site HowToWatch.com is currently on the lookout for someone who's willing to kick back, relax, and watch TV this fall for money. Specifically, the winning candidate will be tasked with watching 100 hours of content on a variety of streaming services, and then report back about the quality of each service's performance. And considering the $2,000 paycheck involved, that essentially means they'll be paid around $20 an hour to do so. Not bad when you consider that typical excessive TV-watching generally only earns you bed sores. The gig is a cushy one, but there are some specifics worth mentioning. For instance, you can't necessarily just spend your 100 hours rewatching The West Wing or The Wire, since your responsibilities will require that you watch roughly 14 hours of live content on each major streaming platform (DIRECTV NOW, fuboTV, Hulu with Live TV, Philo, PlayStation Vue, Sling TV, and YouTube TV), the subscriptions for which will be covered by HowToWatch. And while you're free to watch whatever "live" programming you want (think sports, broadcast shows, news, etc.) whenever and wherever you want, you'll have to take detailed notes about each service's performance using a provided score sheet, and occasionally share your experience on social media. Also, you'll need to have all your hours in by November 1, 2018. It doesn't take much to qualify as a professional TV watcher, but they are looking for someone with a strong social media presence and the ability to recognize the signs of a high-quality stream. If you're interested, all you need to do is fill out the online application by October 4 explaining why you'd be the best pick, then sit back, relax, and hope you get picked to, well, sit back and relax some more.